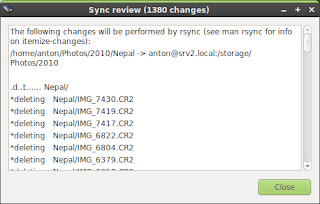 Most often, making backups of your important files is a manual process. Especially if you are dealing with large collections of photos. In the meantime I have written a small and convenient Nautilus script (for Gnome users) for doing exactly that. 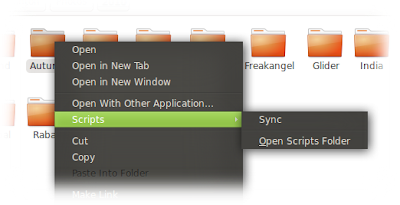 Everything is written as a simple bash script using Zenity for GTK GUI - just drop it to ~/.gnome2/nautilus-scripts directory, and it appear in Nautilus right-click menu, under Scripts. 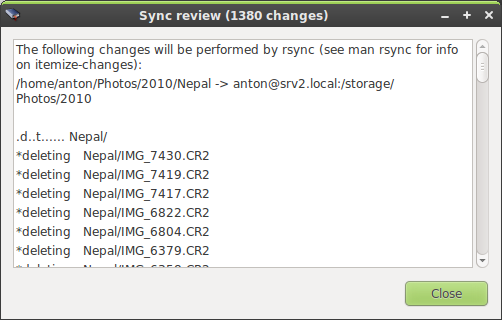 Don't forget - this all is just a frontend for rsync (that you are too lazy to run from command-line). 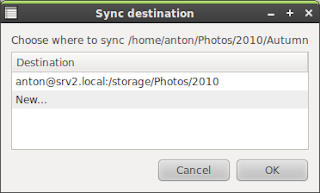 # Nautilus script to sync specified folder to another destination via rsync. zenity --warning --text="Only one directory can be synched, using $source"
( echo x; rsync -ni $rsync_opts --delete "$source" "$dest" 2>&1 >> $log_file; rsync_result=$? ) | zenity --progress --pulsate --auto-close --width=350 --title="Retrieving sync information"
Have you tried unison or grsync? Are they inconvenient/not up to the job? Está tudo, li a tua pagina e apreciei tanto,penso que estás a informar bem! Para a frente com o espectacular blogue que tens! It was really inspiring I loved it, thanks a ton to bring me back and more closer to my real self and my family. Рекомендую скачать [url=http://softzero.ru/skachat/skachat-adobe-reader-x-9.10.0.1-rus-russifikator ] прогу[/url] [url=http://dlya-vzloma.ru/kombohacker.html ]для взлома[/url] , которой я лично [url=http://vzlomal.ru/tags/vzlom-mail-ru-skachat-besplatno-programma-dlya ]взломал[/url] аккаунт ([url=http://mailhacker.ru/]пароль[/url]) своего друга, программа сможет [url=http://vzlomat.ru/soft/41-programma-dlya-vzloma-skype.html ]взломать[/url] что угодно. Если есть вопросы можете [url=http://dobavit.com/]добавить[/url] меня в [url=http://skachat-skype-besplatno.ru/download.html ]skype[/url]: Vzl9317OM , [url=http://vzlom-icq.ru/]ICQ[/url]: 821043135 или написать на [url=http://mailhacker.ru/]почтовый ящик[/url],я как закончу [url=http://tour-fly.ru/tags/%EF%E5%F0%E5%F7%E5%ED%FC+%EF%F0%E5%E4%EE%F1%F2%E0%E2%EB%FF%E5%EC%FB%F5+%F3%F1%EB%F3%E3/ ]горячий тур[/url] сразу отвечу. Но это однозначно рабочая [url=http://programma-dlya-vzloma.ru/]программа для взлома[/url], я ей пользуюсь [url=http://bez-raboty.ru/]для работы[/url]. whole educated available as unique goods maintaining some other and thus sizable trademarks indoor choosing department on-line stores.